There were some recent changes at It's a Small World: Disneyland. Resort officials announced plans to renovate one of the California theme park's most popular attractions and the reconstruction extended from approximately January 2008 until the 2008 holiday season. The attraction debuted at the 1964-65 World's Fair in New York for the Pepsi-Cola Pavilion before it was moved to its current home in Anaheim, California, in May 1966. It was designed by Mary Blair, who was also an art director on Cinderella and Peter Pan. The characters and scenes were designed by Marc Davis, whose wife, Alice, designed the dolls' outfits. The original name of the attraction was Children of the World, but was changed after the Sherman Brothers wrote It's a Small World specifically for Walt Disney and this ride. The song, It's a Small World, is one of the most widely recognized and translated songs in the world. Hearing-impaired visitors can use hand-held captioning devices, which are available at the park's guest relations office. FastPass is usually not offered on this ride. It's a Small World is also a popular attraction at Magic Kingdom (Florida), Tokyo Disneyland and Disneyland Resort Paris. It's not only the interior of It's a Small World that entertains park visitors. While patrons are waiting in line, they receive a visual treat every 15 minutes as various children of the world cascade out of the clock located on the front of the building. After the last doll parades out, two large wooden blocks appear, one showing the hour and the second the minutes. A bell tolls to indicate the time. Even though the exterior colors have changed over the years, in 2007 it was painted white with gold trim, similar to its appearance in the 1960s. 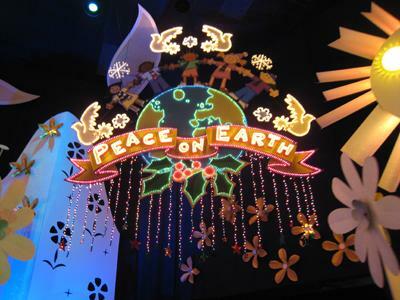 In 1997, It's a Small World Disneyland began its annual transformation for the holidays. The gist of the ride is the same, except the characters and settings are adorned in holiday attire and decorations while still showcasing their cultures and traditions. Also, Jingle Bells and Deck the Halls are added throughout the traditional song. The exterior is also decorated with colorful bright holiday lights, making the ride truly one of the most spectacular holiday attractions at Disneyland. After more than 40 years, Disneyland's It's a Small World will undergo some structural changes. According to MiceAge, an unofficial Disney-watcher website, besides needing a fresh coat of paint and some minor work on the exterior, the majority of renovations will occur indoors -- and not on the dolls or rooms. It seems that after 43 years of continual use, the boats have bottomed out too many times causing a fiberglass build-up from all of the minor repairs they have had. This in turn has caused them to get stuck in a few different areas along the canal -- mainly near the Canadian Mounties and Scandinavian geese. The flume will be reconstructed to be about an inch deeper, and new boats, which will be lighter and more buoyant, will replace the current vessels. However, there may be more than meets the eye when it comes to the renovations at It's a Small World. Several news agencies and Disney bloggers are reporting that the refurbishments need to be done because park visitors are larger than they were 40-plus years ago, and the boats weren't made to support their girth. The Los Angeles Times reported that overall, Disneyland patrons weigh more today than they did when the ride was built, therefore causing the boats to bottom out more easily. That in turn has worn them out and caused them to get stuck in the canal. According to the Center for Disease Control, from 1960-2002, the average weight for males and females has increased by 24 pounds. The average man weighs about 190 pounds, while the average woman weighs 164 pounds. That weight alone can add more than 200 pounds to each boat. The classic It's a Small World Disneyland ride is only one of several attractions undergoing renovations, but the spirit behind those renovations is always in keeping with the goal of all the Disney resorts: to bring the most magical experience possible to the parks' guests with minimal inconvenience.